Today’s world is steadily becoming more and more twisted with people deceiving us and misrepresenting themselves to make a buck. I hope to properly address a few issues here that have weighed heavily on my mind. The first issue is concerning the “teacup” schnauzer. The “teacup” schnauzer is registered as a Miniature Schnauzer by AKC, because it is currently not accepted as part of the “standard” or requirements for show of the Miniature Schnauzer. The American Miniature Schnauzer Club considers their tiny size a fault. That just means they don’t meet the qualifications for show (12 to 14 inches tall). This is true also of the “toy” schnauzer. You may ask, “Where did the ”teacup” and ”toy” schnauzer come from?” The early schnauzer was the Standard Schnauzer. These dogs generally ranged in size between 30 and 50 pounds. Because they were slightly too large to do the job that they were bred for, which was seeking out and killing rats, breeders set out to accomplish breeding down the size. They did this by introducing toy size breeds to make a “miniature” schnauzer. These introductions of new breeds occurred in the 1850’s. Some of the known breeds used were: The Affenpincher, The Dutch Poodle, The Fox Terrier, and possibly The Pomeranian. Colors such as liver, liver and tan, Parti colors, black and silver, and white came from the introduction of these breeds into the Standard Schnauzer. This smaller version of the Standard Schnauzer became the Miniature Schnauzer, recognized as its own breed. By breeding smaller to smaller, the Miniature Schnauzer has continually become smaller and smaller. And thus the “toy” schnauzer and “teacup” schnauzer emerges. (References: The Complete Miniature Schnauzer by Anne Paramoure Eskrigge and Miniature Schnauzers Today by Peter Newman) Just a note to those of you looking for a “teacup” schnauzer puppy. I am an experienced breeder of 36 years. I have had an instrumental part in developing a quality “toy” and “teacup” schnauzer. I have been producing “ teacup” schnauzers for the last 15 years, since 1999 and “toy” schnauzers for the last 20 years since 1994. This is longer than 99% of all the “toy” and “teacup” breeders around. A teacup schnauzer cannot fit into a teacup. Usually by the time they are 3 weeks old or sooner, they are hanging out of a teacup. Teacup puppies mature at approximately 3 to 6 pounds when grown at 7 months old. The bone structure or growth plate stops growing at 7 to 8 months of age. The smallest teacup (3 lbs) cannot fit in a teacup. Teacups ARE NOT 7 or 8 pounds at maturity, as some breeders put on their web sites. These breeders may not be able to produce a teacup on a regular basis so they have extended the weight limits to include 7 and 8 pound dogs and charge teacup prices for them. Teacup puppies do not come out of Champion dogs. It has taken many years to breed down the size of the Miniature Schnauzer. A Champion Miniature Schnauzer weighs between 14 and 18 pounds in most cases. They have to stand 12 to 14 inches tall (AMSC and AKC requirement for show). If they were to have a tiny puppy, the chances are it would be a runt. Runts are unhealthy puppies. They are not tiny because of genetics. They are tiny because of a birth defect. So BUYERS BEWARE of the breeder that brags about Champion blood lines in their teacup puppies. Another sale tactic is to claim that the dam or mother of a litter of teacup puppies weighs less than 6 pounds. A teacup size female either cannot have pups or will have great difficulty and 95% chance of a C-section. I personally have two teacup girls (8 years of age) as my house pets that weigh 5 pounds. Neither of these girls can even breed naturally. The male cannot penetrate them. If they were to get pregnant, they would not be able to carry the pups. Do you want to buy a puppy from a breeder that lies about the size of their breeding dogs? Breeders want you to believe, because the mom and dad of the pups are teacup size, the puppies have to be teacup when they are mature. This thinking is wrong. A Miniature Schnauzer in the toy or teacup size can throw toy and miniature size puppies in every litter. Sometimes the whole litter will be miniatures. In the book, Meisen Breeding Manual by Hilda Meisenzahl, the gene that carries the small characteristic is a recessive gene. That means that it will not become a dominant trait in a puppy unless it is combined with the same recessive gene from the other breeding mate. Tiny sizes are more rare than the larger sizes, even in toy breedings. The large gene is dominant. There is only a 20% chance there will be a teacup puppy born in any planned litter. Breeders are being deceitful if they are claiming to know the mature size of a puppy right after they are born. We cannot ever know if a newborn or even a puppy under 3 weeks of age is going to be a teacup. To assure a buyer of this is unethical. Another issue I would like to address is that of the “Merle” schnauzer. “Merle” is not a color. It is a pattern. This schnauzer mix was introduced within the last 7 years. They have done this by mixing the pure bred Miniature Schnauzer with an Australian Shepherd. IT IS A MIX BREED DOG, NOT A PURE BRED MINIATURE SCHNAUZER. AKC does not and has stated emphatically that it will not register these dogs as purebred AKC schnauzers. The Australian Shepherd is a shedding dog (Big time!!!). The Australian Shepherd has a genetic disorder (MDR1, multi drug resistant gene) that is intolerant to Ivermectin and many other parasite drugs. Dogs must be tested to find out if they have this gene. They have short, coarse hair on the face and legs. Many of the mix breed offspring also have short, coarse hair on the face and legs. They have eye issues, cataracts and blindness. Some of this is associated with the blue eye. The Australian Shepherd is not a breed or color used to produce the Miniature Schnauzer from the Standard Schnauzer in the 1800’s. Breeders calling them a “merle” schnauzer fool the public into believing that they are getting a “pure bred” schnauzer of a different color. One “merle” schnauzer breeder claims that the colors of Parti, Liver, Liver and Tan, White Chocolate, Wheaten, etc. were introduced (bred) into the Miniature Schnauzer breed in the 1990’s. This is ABSOLUTELY FALSE!! As earlier in this article is stated, these colors were “bred in” with the toy breeds that were used to bring down the size of the Standard Schnauzer to produce a “new” breed, the Miniature Schnauzer, in the 1850’s. That is 140 years before the claims of this uninformed breeder. This breeder needs to “get educated”. To spite me, she has put my bloodlines on her list of dogs that are in the pedigree that she claims produces the “blue eye”. None of my bloodlines have or ever will produce blue eyes. The blue eyes in her case come from the Merles. 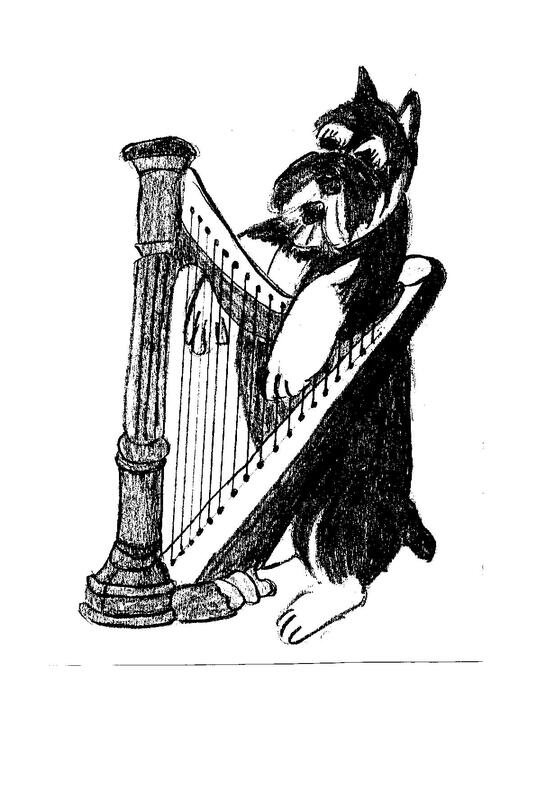 Check out the book, The Complete Miniature Schnauzer by Anne Paramoure Eskrigge in chapter four on Color Inheritance (of the Miniature Schnauzer). The chapter starts on page 312, but pay close attention to the evidence of color inheritance on page 333 paragraphs 1 and 2. Interestingly enough, the common salt and pepper color of the Miniature Schnauzer (called chinchilla back then) did not become a color sought after by breeders till after the late 1920’s. The color at that time was more commonly the bi-colors (partis) and reddish (liver) dogs. Even in the late 1930’s there were still a considerable number of “bicolors” and “redish” puppies. This was basically because the “bicolors” had good confirmation that they were seeking. Though some Australian Shepherds are well-tempered and good pets, many can become extremely destructive if their energy is not directed in a positive way. These dogs require a minimum of 2-3 hours a day of play, exercise, and attention (Ref: Wikipedia.org). Combine this personality trait with that of the Miniature Schnauzer and you could have trouble on your hands. Those of you who have bought a “merle” puppy may have noticed that they still carry the traits of a herding dog. They may be trying to herd you. Now there is a new fad going around among breeders who know better. There are AKC registered Miniature Schnauzer puppies with “blue eyes”, “blue eyed” schnauzers. “Blue eyes” is not and has never been a schnauzer trait. How did this happen? And how did they get them AKC registered? Your guess is as good as mine. I can guarantee it was not an ethical act. So “BUYER BEWARE”, these dogs are not pure bred Miniature Schnauzers. They are a mixed breed. No matter what their pedigrees and AKC papers say that they are. This blue-eyed dog could only have been produced by breeding another breed to the Miniature Schnauzer (such as the Australian Shepherd or possibly the bulldog) that carries for the blue eyes. In breeds that have blue eyes, it is not uncommon for the “blue eyed” gene to carry for blindness. All that the rest of us honest breeders and buyers can do is make a stand against buying and registering dogs and puppies produced by unethical people. “Blue eyed schnauzers” is just another unethical moneymaking scheme like calling a mix breed a “merle” schnauzer. There is too much room for doubt that the blue eyed dogs registered as schnauzers are pure bred. There is no truth to this claim. Those of you who are buying these dogs are paying an awful lot of money for a mutt. If any of you pet owners have bought one of these dogs unawares, call AKC and complain. After several of you complain, AKC will investigate. When they check out this kind of complaint, they come unannounced. Please, no copying or reproducing without permission.